Less than a year after its members murdered 11 Israeli athletes and one German police guard during the 1972 Summer Olympics in Munich, the infamous Palestinian terrorist group Black September Organization (BSO) on March 1, 1973 launched a brazen raid on the Saudi Arabian embassy in Khartoum, Sudan, kidnapping U.S. Ambassador Cleo Noel and Deputy Chief of Mission (DCM) George Curtis Moore, along with the Saudi ambassador, his wife and four children, and the Belgian and Jordanian charges d’affaires, who were all attending a farewell dinner in honor of Mr. Moore. The BSO demanded the release of Arab militants. 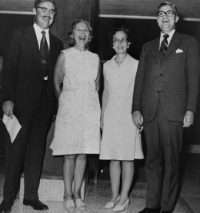 President Nixon said in a March 2 news conference that the U.S. would “not pay blackmail.” Ambassador Noel, Moore, and the Belgian were allowed to write final letters to their wives; they were killed 12 hours later. Demands for a plane were rejected, but the terrorists surrendered after three days to Sudanese authorities and were later put on trial, but justice was not served. Robert E. Fritts recalls how he was brought in from Washington to replace Moore as DCM, how he helped reestablish morale among the distraught embassy staff, and the frustrating pursuit of justice against the BSO. He was interviewed in 1999. For one former hostage’s critical view of U.S. policy, see Mike Hoyt’s piece. Read about other Foreign Service officers who died in the line of duty and when the U.S. Ambassador was kidnapped at a reception in Bogota. Go here to read more about Jordan’s Black September. FRITTS: I was in the Department of Commerce on March 1 when I was called out of a meeting by the secretary on the Sudan desk who said I was to return to the Department immediately, but she was not permitted to tell me why. I said, “Immediately?” She said, “Yes, immediately.” So I broke off the meeting, went back, and found out that Ambassador Noel and Curt Moore had been taken hostage by Black September Organization terrorists while attending a farewell reception for Curt Moore at the Saudi embassy in Khartoum. This was, I think, the first ambassadorial hostage situation of what became a string of hostage and terrorist situations to this day. I found out that the principals were meeting in the Operations Center, to which I repaired immediately. 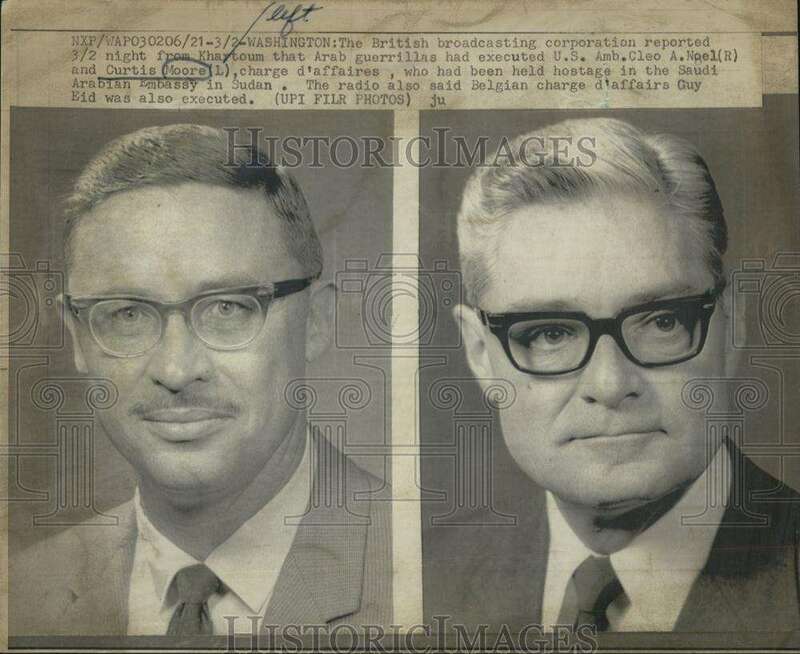 Bill Macomber, then Under Secretary for Management, had convened a task force there and the ongoing discussion was what to do and how to do it…. I was, of course, but a fly on the wall. Macomber finally said, “Well, we’ll leave right away for Egypt and see what develops”. The idea was to use Air Force transport, fly to Cairo, and determine what to do based on the evolving situation. Macomber envisioned guiding any Sudanese negotiations with the terrorists and wanted to be closer to the action. When we arrived in Cairo, our U.S. Interests Section Chief, Jerry Greene, was at planeside. He told Macomber that the latest word from Khartoum was that the Sudanese were negotiating with the BSO terrorists and that the hostages–our two plus several foreign ambassadors and the honorary Belgian charge d’affaires a.i.–and the terrorists would be flown to Cairo under safe conduct and all released to Egyptian authorities. Macomber thus decided to stay in Cairo to advise the Egyptians. He didn’t want to be en route to Khartoum if the hostages and terrorists were en route to Cairo. In the meantime, to augment the staff in Khartoum, he sent Alan Bergstrom, a former political officer in Khartoum, and me onward to buttress the embassy. A commercial flight in Cairo had been held pending Macomber’s arrival. Alan and I boarded and took off for Khartoum…. Q: Good God!… So what does one do? Out of breath at the top of the stairs? FRITTS: Well, I asked whether we had confirmed the deaths and, if not, how could we do it? His answer was uncertain. I said that finding out was the top priority for the embassy and Washington. He then sent a Marine to advise several of our embassy officers who were monitoring events outside the Saudi embassy. My next thought was how could I be most useful? Others might behave differently, but I decided it was not to come in and take a high profile approach. I told Sanderson to remain in charge as he had been for the past two days, that I didn’t know the embassy, the staff, or even the city. Nor did I know Sudanese government officials, nor they me. The American embassy staff was very small: only a half-dozen American officers, two or three secretaries, all in shock and without rest. Most of our Sudanese FSNs [Foreign Service Nationals] were hunkered down at their homes. I decided the best thing I could do initially was just do whatever was helpful…. The Department and Embassy Khartoum were linked by a crude direct TTY [teletype] line that printed letter by letter. It was very slow and limited to only several sentences at a time. While talking with Sandy and others, I saw the TTY keyboard and small screen on a table with a chair in the corridor. It was unmanned and only glanced at intermittently when an officer happened to pass by. I knew how thirsty the Department was for information and its frustration with the dead time between questions and responses. So I said, “I’ll start with this.” Because of consultations, I knew who was who in the Department and thought I knew what they needed or would need. I manned the TTY for most of the next 36 hours. It became our embassy cockpit. It also freed up those who needed to be operational with the Foreign Ministry, the police, the Army, the media etc. I developed an increasingly in-depth dialogue with the Department, including sets of short evaluations, impressions, what next, etc. Versions were also being passed to Macomber, who was still in Cairo. The haboob was still howling. They normally last hours; this one lasted three days. Even the following noon it was black. Dust and grit were everywhere, in your eyes and teeth. Every flat surface was layered. We were covered in gritty dust. The dim embassy lights were still battery powered. It was a scene from hell. Meanwhile, evidence accumulated that Noel and Moore had been killed, but no one had been inside the Saudi embassy and actually seen the bodies; so it wasn’t definitive. No one at our embassy wanted to accept that they had, in fact, been killed. Finally, it seemed to me time to bite the bullet and I typed out a message to the effect that they were “presumed” dead and future USG [U.S. Government] actions should be based on that premise. I understand the reaction back at the Operations Center was emotional. After further negotiations, the Sudanese gained access to the Saudi embassy and viewed the bodies. The remaining diplomatic hostages were released and the Sudanese took custody of the BSO terrorists. The honorary Belgian diplomat, half-Egyptian, had also been killed, probably, we found out, as part of a past personal issue with one of the terrorists. Q: What else do you recall from that awful time? FRITTS: One human vignette I recall vividly is that the BSO operatives “permitted” Noel and Moore to write “last words” to their wives, who were together throughout at the residence. The murdered men’s notes, sealed in incongruously embossed Saudi embassy envelopes, were given to Sanderson by the Foreign Ministry. He asked me if I would deliver them? I said, “Sandy, I’ve never met Mrs. Noel and Mrs. Moore in my life. I’m even here as a live substitute for Moore. They’ve got enough to handle without factoring me in. You know them well, they know you. It’s better if you deliver the letters.” He left for the task in tears. He returned to say how appreciative the wives were for all everyone was doing, including me by name. And he commented that neither wife had shown any tears. After much too long, the bodies were retrieved from the Saudi embassy basement, where they had been gunned down against a wall. 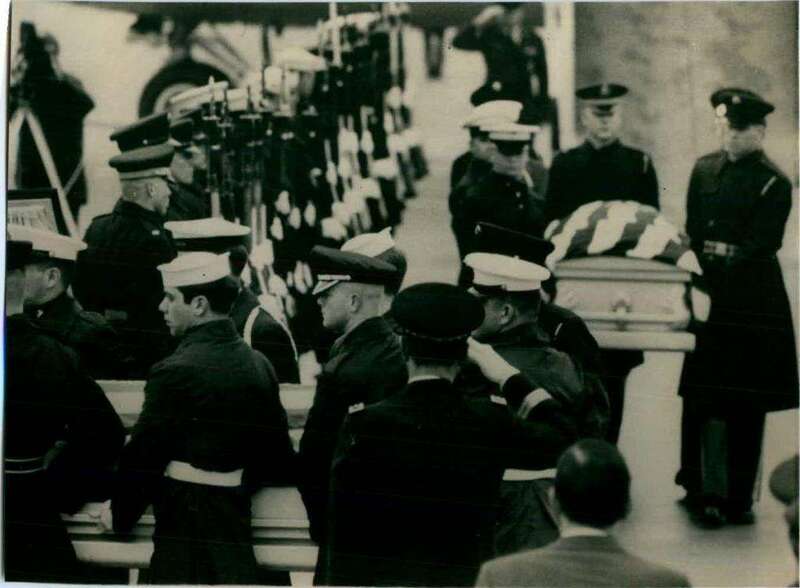 Sandy identified them and he and Braun assisted in the preparation of the remains and putting them into the caskets that every embassy has for emergencies. They lay “in state” in one of our embassy houses overnight and the next day. We had a Marine Security Guard in dress blues in formal attendance, plus the American and ambassadorial flags. It was like a wake: embassy officers and Sudanese staff would come and go and come again. I think a few VIP Sudanese stopped by as well, even though the condolence book was at the embassy. Then there was the departure ceremony. With the haboob over, Air Force One or Two, which had staged to Cairo, arrived with Macomber. We and the Sudanese arranged a tarmac exit ceremony for the coffins and the widows, attended by the government and diplomatic corps. In one of those poignant paradoxes you often see in Africa, the coffins, carried by the Marine Guards with the wives, me, and the other embassy officers following, were accompanied by Sudanese troops slow-marching to a Sudanese military bagpipe band playing Auld Lang Syne as a dirge. I never hear that tune at New Year’s but now it saddens me. In Washington there was a memorial service at the National Presbyterian Cathedral, which my wife Audrey attended to represent the embassy. She met Lucille Noel and Sally Moore there. Q: What did Macomber do? FRITTS: He only overnighted. Of course, he met with President Nimeiri and other key officials. I attended, but Bergstrom did the reporting cables. Nimeiri and the Sudanese were incensed. They felt the attack had besmirched their international reputation and personally insulted them, that Qadhafi was the main force behind the attack, at least in part to punish them for renewing formal U.S. ties. Macomber’s emphasis was on the trial and punishment of the murderers and we thought we had firm assurances. A trial and conviction of anti-American Arab terrorists by an Arab state would be a first in the Middle East. On a personal note, I had a memorable “exit meeting” with Macomber. All of us had been sleeping, such as it was, in the embassy. I used a dust ladened sofa in Ambassador Noel’s office. With the new arrivals, every sofa and chair was occupied. For Macomber, we rigged up an actual bed (sort of) in our tiny dispensary. You know, there’s an “in-box” exercise for Foreign Service applicants where they arrive at a post to replace an officer who’s died suddenly. They have to go through the contents of an in-box and determine priorities. Well, I now had two in-boxes and it was for real. Among the papers in Noel’s box was a photo, taken by the desk where I now sat and developed at the embassy, of his taking the oath as ambassador on the day of his capture. He had come to the Sudan on an interim appointment and been confirmed by the Senate in absentia. Curt Moore had delivered the oath of office. The two men and their wives were wrapped in laughter and friendship. Hours later, both men were dead. If I had arrived in Khartoum directly from Jakarta, I might have been with them. I learned later that Moore had possibly been at least vaguely aware of being under surveillance, but had discounted it. Noel had also been advised to be cautious, but, with his deep experience in Khartoum, had said that very day, “Nothing will happen to me in the Sudan.” He was right about the Sudanese, but wrong about the BSO, Libya, and, maybe, Yasser Arafat. Q: So how did you decide to approach managing the embassy? The first week or two was just terrible; each day worse than the one preceding. Aside from lack of knowledge and contacts, it was a challenge to resuscitate and inspire officers from such a trauma. I set initial personal and embassy goals, at first day-to-day and then longer. I soon realized the American officers found solace in focus. They also had been bonded by a crisis that encompassed me. It was March and they began to respond to my game plan of rendering honor to the fallen by having the embassy rebound as a fully functioning professional entity by July 4, 1973. If successful, we could top it off symbolically with the first formal July 4 celebration in an Arabic state since 1967. If we could do that, I would have done what I could as Charge. The embassy would then be a proven, ready, and able vehicle for a new ambassador with shoulder patch to move forward. Sounds rehearsed, but it was embedded in my mind and recallable today. In retrospect, I consider Khartoum the formative period in my Foreign Service career. It justified the approach I had always taken of wanting responsibility and across-the-board experience. Frankly, when I left the Sudan, I felt I could handle any task the Foreign Service could assign. Q: We’ll come to the punishments, but tell us a bit about the trial first. FRITTS: Months further…they were convicted in a trial on charges of murder. The good news was that our foremost policy goal had been met: the conviction of anti-American terrorists in an Arab state. The sentence was life imprisonment, which the Sudanese Supreme Court commuted to X years. The bad news was truly bad. They were eventually turned over surreptitiously to the PLO to “impose the sentence” and spirited out by plane to Cairo. I think then-Ambassador Brewer only found out about it after the fact. The USG pressured the Egyptians not to release them and they were put in a form of progressively loose house arrest in a Nile mansion. Eventually, they evaporated. A travesty! Q: As for controversies, I earlier asked about the role of President Nixon. FRITTS: It’s argued that President Nixon’s public announcement, while Noel and Moore were still held and alive, that the U.S. would not negotiate with terrorists for hostages precipitated their execution. I have no proof either way. Nobody does. However, my slant is different. I think they were doomed at the outset, in that the operation was undertaken expressly to kill Moore as a way to reestablish BSO credibility in the wake of a BSO fiasco in the takeover of the Japanese embassy in Kuala Lumpur several months previously. Those hostages had been successfully released and there was widespread international media comment that the BSO was a paper tiger. In contrast, Cleo Noel was taken by chance. The BSO attacked Moore’s farewell reception and Noel just happened to be there. The BSO found that they actually had two Americans rather than one. If I had not argued for consultations in Washington, it might have been three.